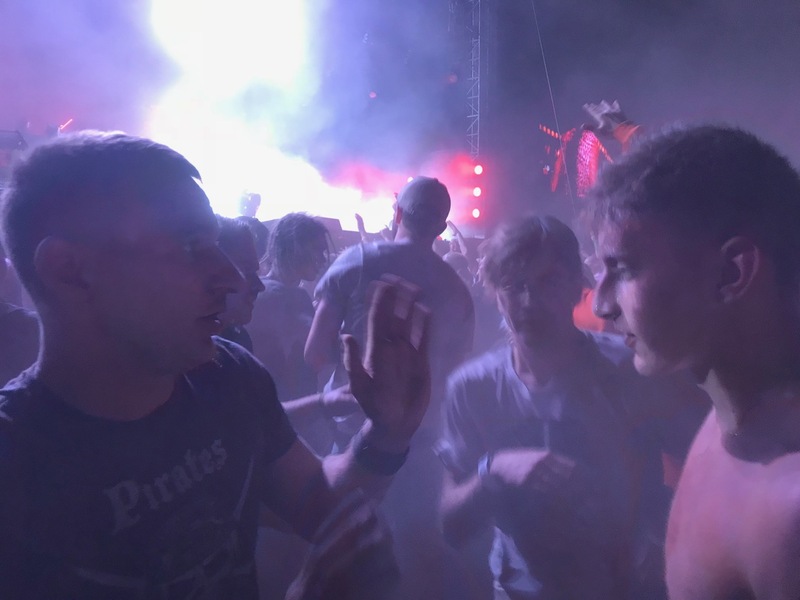 When I was in Latvia in 2016, I learned about this big music festival that happens every July. Both Ansis and Rita talked about it. 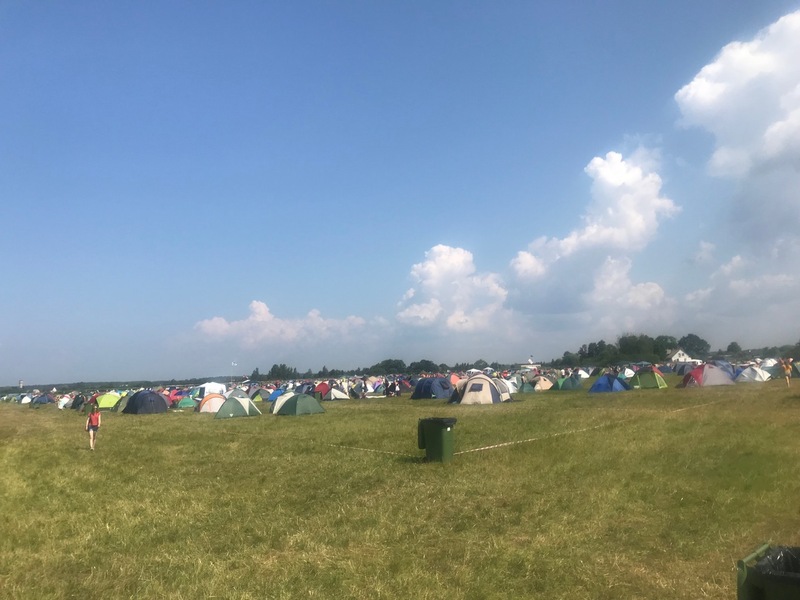 It is one of those classic stories where a couple of Latvians had a dream to get some bands to come to this tiny country, play in a field in a small town by the sea, and hope that people will show up. And show up they have and they do! 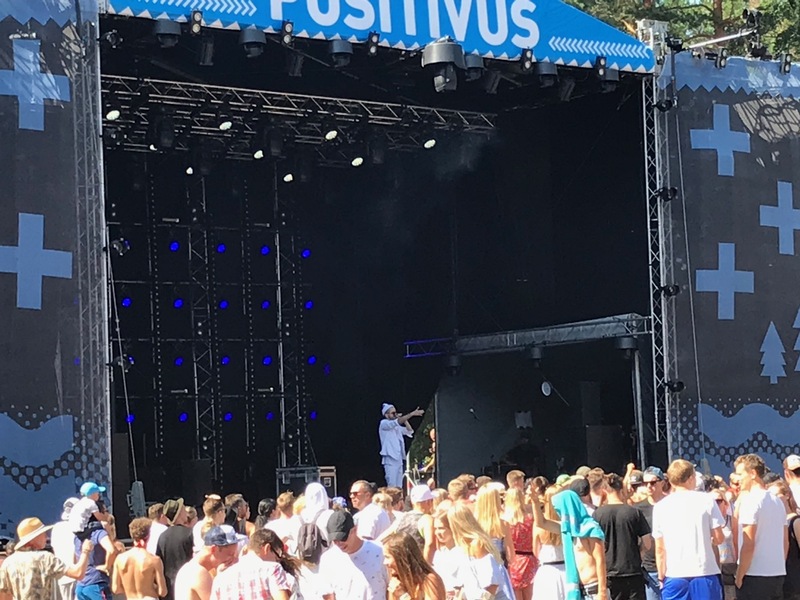 The Positivus Festival has been going now since 2007, and each year it gets a little bit bigger and a little more impressive. 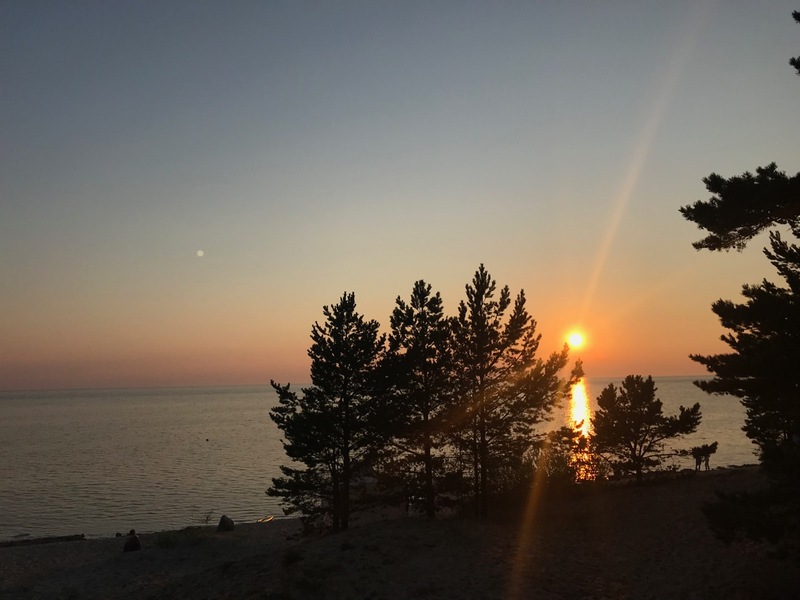 It all happens in the small seaside town of Salacgrīva which, according to the website, seems to have a lot going for it! Wikipedia says the town has about 3000 people, but the festival attracts about 30,000 (2017 numbers), so that is cool. For those of you who like math, that would be like 5 million people coming to Omaha for something! This year, the headliner was Nick Cave who just happens to be one of Rita’s favorites, so I got tickets way in advance. Then, when the time finally came to go, we had to do some planning. We decided to get a camping spot and stay in a tent for all three days! 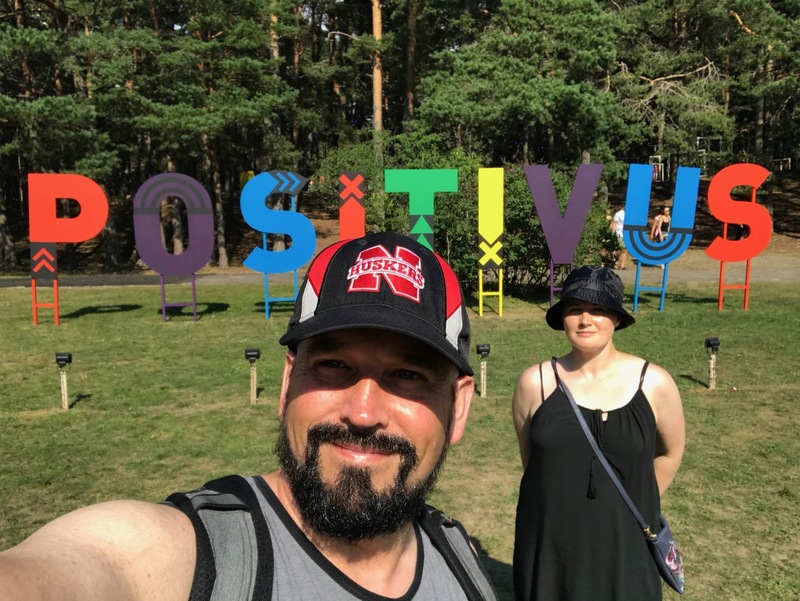 The people of Positivus are really thinking and helpful; they had a nicely priced shuttle to and from the concert which is about 100 km from Riga. So we packed a bag (with not enough blankets) and headed to Salacgrīva at 9:30 a.m. on Friday morning for the rock-n-roll show! 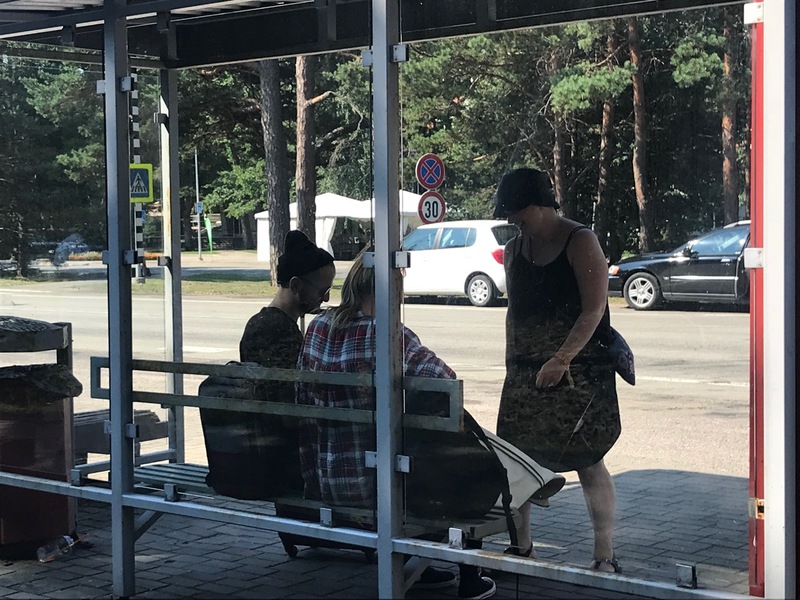 When we arrived, Rita just happened to see one of the Latvian rappers sitting at the bus stop. He was on the cover of the local magazine she had in her bag, so she went to get his autograph. His name is Ansis! We saw him on Saturday, and he was pretty good, although I admit that my Latvian is not advanced enough to understand the nuance of Latvian rap lyrics. I enjoyed this song. After setting up camp and realizing that sitting in a tent on a hot day is no fun at all, we crossed the highway to enter the festival grounds themselves. 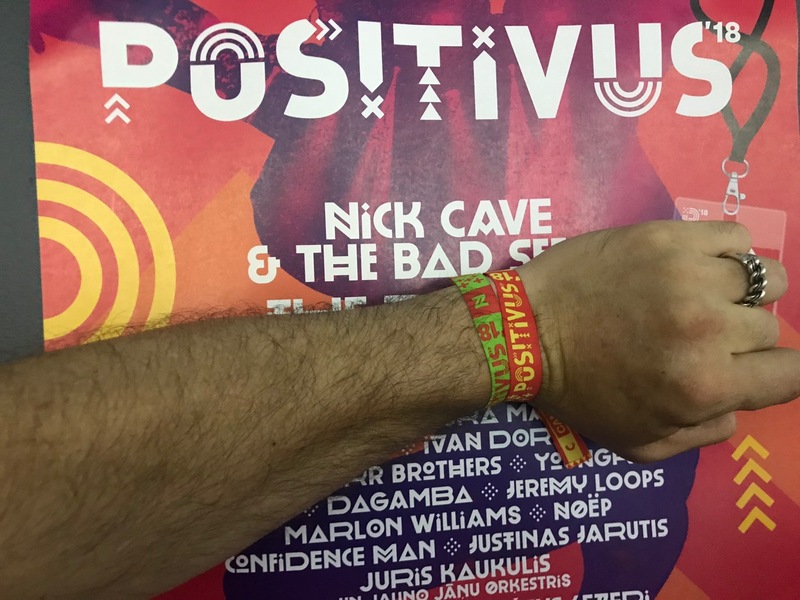 The Positivus festival is arranged in such a way that nothing seems very far, but each stage is well isolated. Sometimes sounds would overlap while walking from one space to the next, but for the most part, keeping five stages and a little movie theater operating continually for three days without a hitch is an impressive feat. On top of all that, there were dozens of food and drink vendors and sponsors with tents and trucks. I never had to really wait in line for anything, which is just incredible. Efficiency and ease of access seemed to be major points of order for the people working so hard behind the scenes. Looking back now, the weekend was a bit of a blur, but I wanted to try to give credit to all the artists we saw. Our day on Friday started with a visit to the movie tent for a viewing of Baltic Shorts. Short movies are always fun and weird, and these did not disappoint! Our favorite was the one about the gay fox. I can’t find it now, but there are some cool looking shorts here. During much of the day, we walked to the seaside and then to the village of Salacgrīva itself. You might call it a day of grounding. 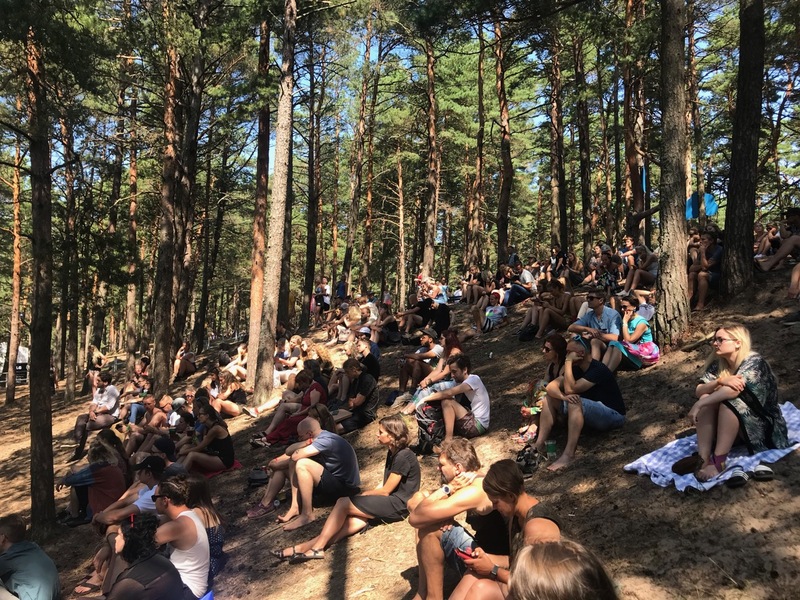 The festival space is surrounded by beautiful trees and paths and butts right up agains the Gulf of Riga. People were swimming and enjoying the warm weather. 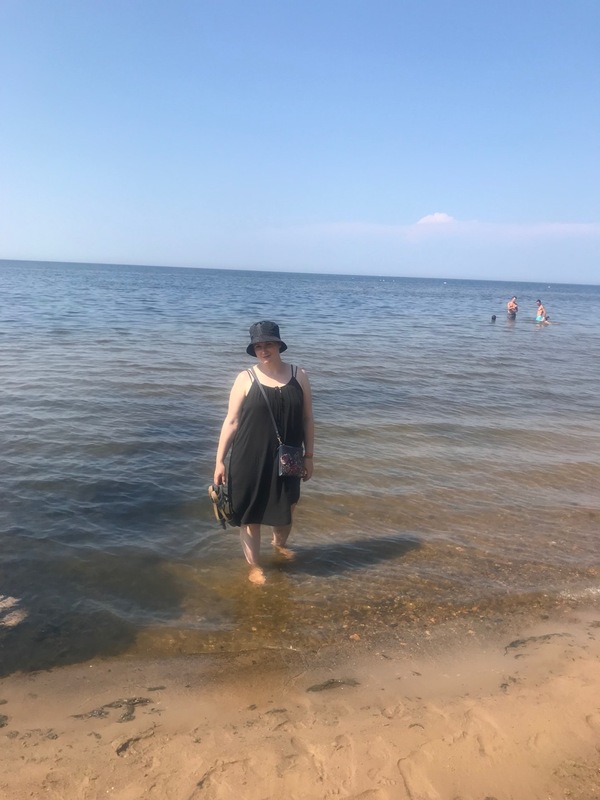 We waded a bit, but I am not much of a swimmer. We also spent time in the hammocks. There was an entire hill of hammocks in the shade giving people the opportunity to just chill. Next to the hammocks was the Arts and Nature Stage for small performances. I got to see a bit of a Latvian Improv troupe. At one point, one of them wore a MAGA hat, and there were some Trump jokes. I felt right at home. The village is an old fishing village and it has nice charm. The Salaca River flows into the sea right where the town is, so it makes for some lovely scenery. I think we then watched a bit of NOËP and Tove Lo. We decided that Friday was young people’s night based on the bands, and we didn’t stay for the headliner Years & Years. On the way out of the festival, droves of young people were storming in for the big show. I am kind of glad we skipped it. Again, I think this makes me an old man. The nicest part was leaving the concert a bit early to catch the sunset on the sea. Gorgeous. We were a bit more musically ambitious on Saturday. Ansis: As I said before, we watched Rita’s new favorite Latvian rapper, Ansis. He had a nice crowd and a good stage presence. We then watched the famous Latvian film Četri Balti Krekli (Four White Shirts) about a musician and Soviet Censorship. It was an interesting take on a time and place I can only imagine. The movie was shown with great success at Cannes this summer. Singapūras Satīns: Then we watched another Latvian rap group, the Singapūras Satīns. They were a lot of fun, although, again, I didn’t fully understand the lyrics. The last song was about not speaking Russian which was pretty funny. I don’t know what the Bs are on this video… but enjoy! We skipped around the grounds after that watching a few other concerts. Shipsea: was a highlight for me on the main stage. He sang traditional Latvian songs with several guest performers. I really liked how he let these young women sing the songs and at the end, everyone came together for the big finale. He performed songs from a famous Latvian album Par Lietām, Kuras Tā Ar Nekad Nepāriet by Imants Kalniņš & Ainars Mielavs . You can listen to the whole thing on youtube. Eventually, we made our way back to the tent. Rita planned to skip The Prodigy, but I felt it was a moral imperative to see this heavy, synth, punkish, techno headliner. So I said goodnight, and walked the long road to the festival alone. I arrived early enough to get toward the front. In my limited experience as a Latvian concert goer, I have found that they are not very aggressive about positions at concerts. They kind of just let you walk through, so I figured that if I wanted to get closer later, I could. I had no idea what to expect, but I was kind of hoping to see some moshing and have some fun. The Prodigy: They have been around for awhile, but I never really got into them, and only new a couple songs because I wanted to be a little prepared. I ran into one of Rita’s friends, a music critic, who was very small standing near where I was and even squeezing forward. I warned her that things could get ugly. She didn’t seem to be worried. I was hopeful when the show began with the music from A Clockwork Orange. 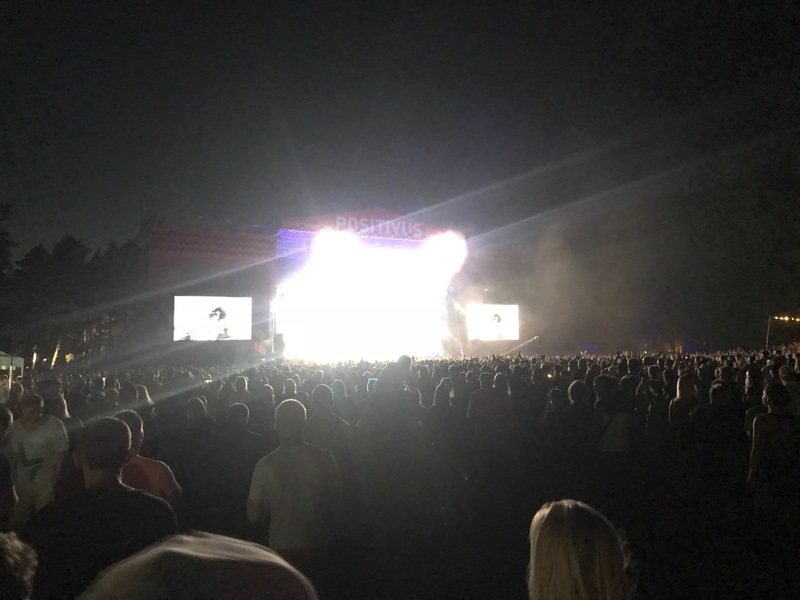 But when The Prodigy got on stage, they just started yelling, almost begging the crowd to get riled up, and riled up they did get. Some of the young people tried to form a little mosh pit, but I don’t think anyone has educated the general public on how to mosh. Instead of slam dancing and smiling, they were throwing punches and elbows. I decided to just stay out of it after I saw one guy punch two kids in the face. It was just too weird. After four or five songs, with the lead singer calling out for his “Voodoo people” (whatever those are), I decided that I was tired and all Prodigyed out, so I walked humbly back to the tent for a sort of okay-nights sleep. I said before that we didn’t bring any real blankets. I had a mattress pad and a small sheet. It got really cold at night, and the party people all around us didn’t really care if we got any sleep or not, so we did the best we could. I forgot to mention that there were portapotties for our general use at the campsite, but we decided to pitch a tent far away from them which seemed like a good idea at the time… but when it is 3 a.m., very cold out, and you are very tired, walking a half-mile to a portapottie is really not fun. I know… why didn’t I just pee outside… but, I am just not a very public urinator. And there were 3 Euro showers. The key was to wake up early because the rest of the party campers weren’t conscious until after 10 a.m. The big finale! The big shebang! All the marbles! I joined Rita late for the Satori Readings. 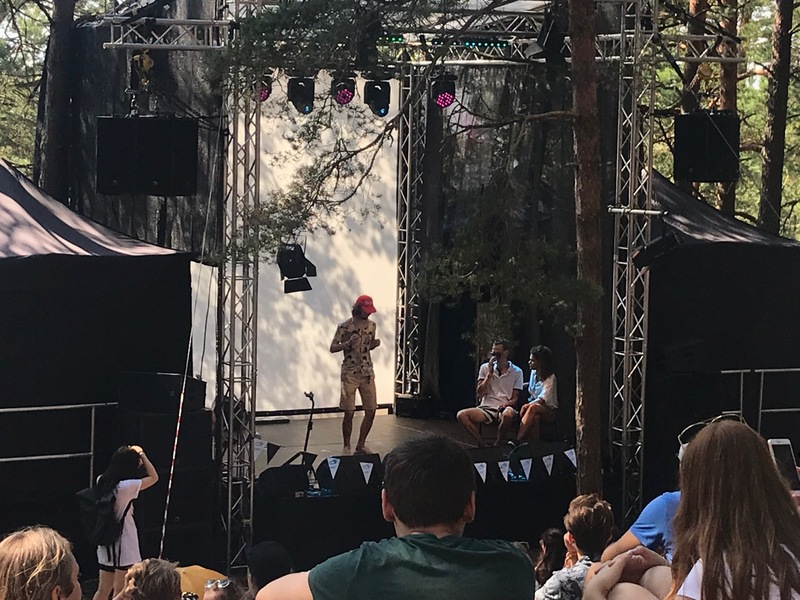 Latvian poetry on the Arts and Nature stage… and the hill was packed with people! Way to show up Latvians! After lunch, we watched Vladislavs Nastavševs/Ezeri. The crowd was small, but we went right up to the front to get an earful of Russian folk rock. It was hard for me to get into, but the singer was cool. At some point we took a break, had some lunch and chilled before the evening session. Grupa Sigma: My favorite band of the show was probably Sigma. Rita claims to be one of their biggest groupies! She was really happy because she saw lots of colleagues and people she recognized. 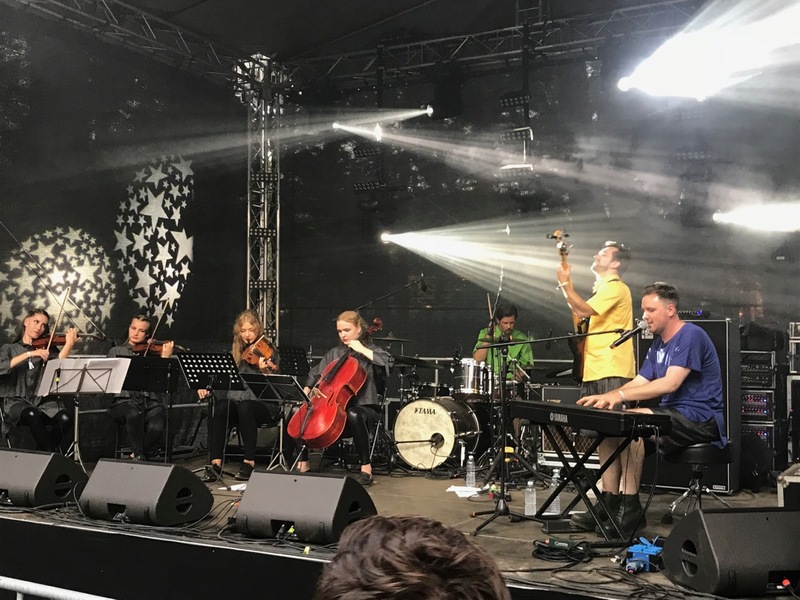 Grupa Sigma plays some seriously melancholy melodies, but they are beautiful and danceable. By the end of set, we were up by the stage dancing. Finally, it was time for the big show! 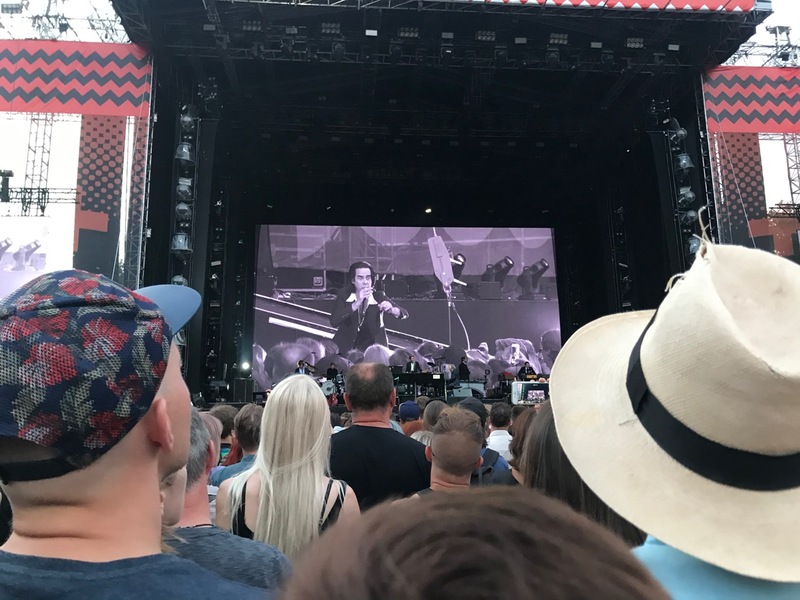 The funny thing is that I had only listened to a couple of Nick Cave songs prior to the concert. I wasn’t a huge fan, but I liked what I had heard. He seemed to have a Leonard Cohen vibe. 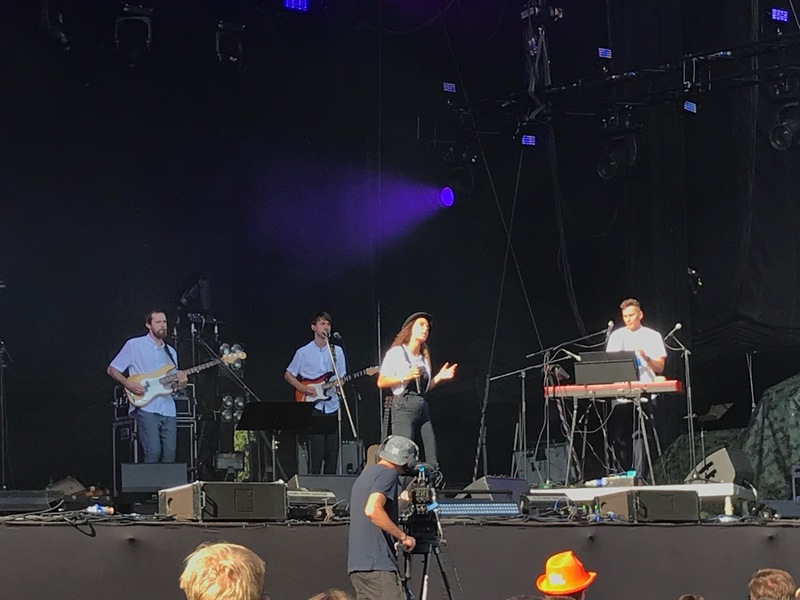 I thought that we would see this singer/songwriter on stage with a piano being really chill and pompous. I was mistaken! 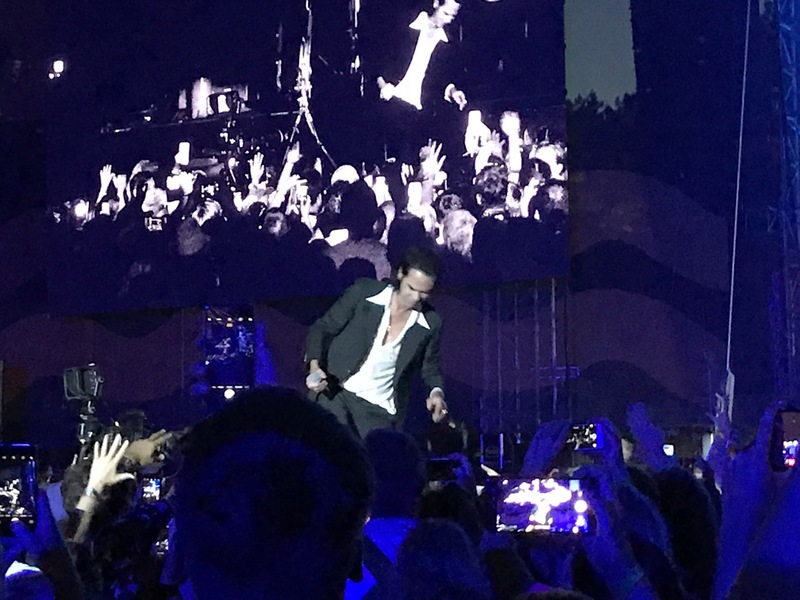 Nick Cave’s showmanship is off the charts! He came out on fire. The stage was full of people making up a wonderfully powerful orchestra. Other than Nick, the crowd favorite was Warren Ellis who played everything, including a rocking violin! Nick walked right out into the crowd and shook hands with people. It was just absolutely amazing! Each song was epic in scale and scope. When I got home, I watched a few videos, and the studio versions don’t even come close to his live production. By the end of the show, he took about 40 people from the front row onto the stage and sang three songs with them. You can see the last song “Push the Sky Away”. The audio isn’t the best, but you can at least see the reaction of the legendary introverted Latvians on the stage! By the third song, I announced that Nick Cave was worth the price of admission, and I will stand by that statement! 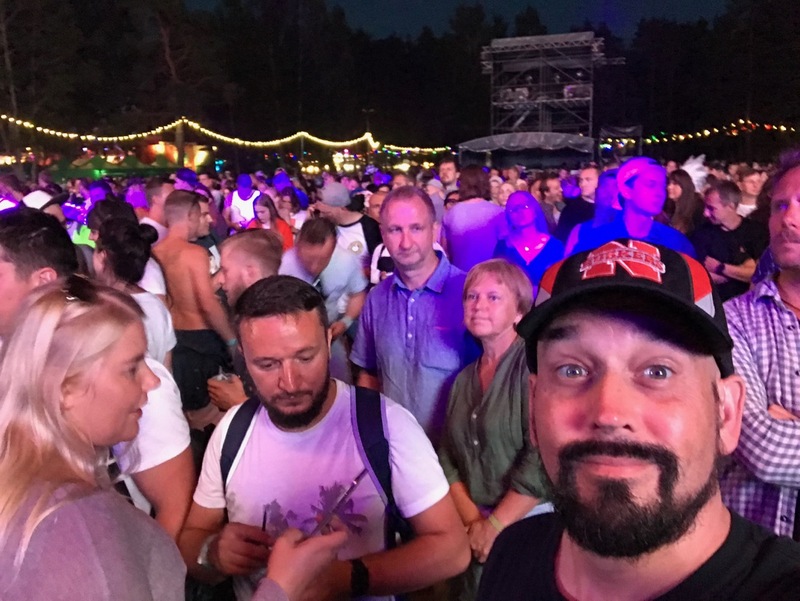 I thought the crowd would be quieter on Sunday night, since the concert was officially over, but in Latvia, the party doesn’t end until dawn (or later). And the mess they left was impressive (if not a bit sad). The trip home was easy, and I was very proud that I was able to get the tent and all the stakes into the original bag. It is the small things in life, right? I didn’t write about the food at the festival at all, but it was amazing. They had some typical fast food type places, but we had oysters, slow-food, and other good stuff. They also had a whole bunch of vendors with hand-made crafts and clothing. I am not sure if I would have the energy to do another three day festival next year, but I highly recommend it if you haveņt been. And if the headliners are people I really want to see, I will surely return!